The International Criminal Court (ICC) has acquitted former Ivory Coast president Laurent Gbagbo of crimes against humanity, after at least 3,000 people were killed in post-election violence in 2010 when he refused to accept defeat. The ruling is being seen as a serious blow to the war crimes tribunal in The Hague, with ICC judges ordering the immediate release of the former president -- the first head of state to stand trial at the ICC -- alongside his former youth leader, Charles Ble Goude. Prosecutors allege the 73-year-old, who has spent seven years in detention, held onto power "by all means" after he lost the election to now-President Alassane Ouattara. Head judge Cuno Tarfusser said the ICC "by majority hereby declares that the prosecution has failed to satisfy the burden of proof to the requisite standard." DW spoke with historian and independent trial monitor Thijs Bouwknegt about the significance of the acquittal for the future of the ICC and those who were affected by the violence in Ivory Coast. DW: Mr Bouwknegt, How do you explain the decision by the ICC? Thijs Bouwknegt: The decision by the ICC to acquit and also to immediately release the two former suspects does not come really as a surprise if you know how the case has been developing since January 2016. Basically, the trial was quite problematic, particularly related to the evidence which was presented by the prosecution office. Today (Tuesday) the judges said that this evidence was not enough to actually order the continuance of the trial and give the defense a voice in the proceedings. Of course, this is a big blow to the prosecution's office which is there to prosecute the most senior persons who are allegedly involved in crimes against humanity, genocide and war crimes. It basically shows that it's incredibly difficult to secure reliable and convincing evidence in criminal cases against these people. What options does the prosecution team have now? Basically, there were two decisions made. 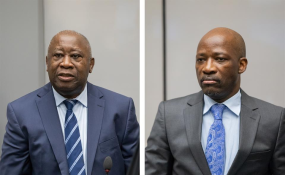 The first one was about the acquittal of Gbagbo and Charles Ble Goude and the prosecution's office can appeal that decision after the decision has been published by the trial chamber. That's option one. The second decision applies to the immediate release of the two gentlemen. The judges have already scheduled a hearing for Wednesday morning to hear the arguments of the prosecution's office about the immediate release order. So they can appeal it, but they actually have to wait for the next decision, pending that appeal which will take place tomorrow. Some people took to the streets on Tuesday in Ivory Coast, especially the relatives of those who lost their lives under Gbagbo. What do you think this verdict means for them? I think for victims it means that they don't know who was actually responsible for the crimes that were committed in 2010 and 2011. So now the victims have to wait for other proceedings. We know that the ICC is still conducting investigations, including other suspects or perhaps trials in Ivory Coast itself. This can be complicated because the Ivorian government has announced that it will apply an amnesty to the perpetrators of the violence in 2010 and 2011 within Ivory Coast itself. So the victims can be left feeling like they have not gotten any justice. There are divided opinions over the ICC court in Africa. What message do you think this ruling sends to other African leaders and people who look up to the ICC in such cases? I think that the track record of the ICC has so far shown that it has only prosecuted and tried Africans, including several high-level leaders or former leaders. It has had a really hard time trying to convict these people. So far we now have more acquittals than verdicts, which I think is already quite telling about what the ICC is actually capable of. I think for leaders, and especially leaders in countries where crimes are perhaps being committed, this also sends a signal that, even if they end up in the future at the ICC, there is a strong chance that they will be acquitted, even midway through a trial, or after a trial or even after a conviction. I think we only have to look at the prior cases of Gbagbo but also [Kenyan president] Uhuru Kenyatta and [DR Congo vice-president] Jean-Pierre Bemba last year, to see that it's highly difficult for the ICC to actually convict somebody. So how effective is the ICC? I think so far the ICC has not been successful or effective in prosecuting cases in a variety of African countries. Basically the most steady convictions only came from those people who pled guilty, which means that there is no necessity for a trial to actually take place. In all the other cases where the burden of proof is on the office of the prosecutor, there were enormous problems. This was already happening in the first case relating to the DR Congo, but also in other cases in the Central African Republic (CAR) and now as well in the Ivory Coast. So I think this sends a signal also to the office of the prosecutor that they have to rethink how they are going to take on a case, who they will go after and when. I think in many instances the ICC prosecutors office basically picks suspects by default because they are state leaders and only after they have apprehended these suspects do they start to look for evidence which could convince judges in a criminal trial, which perhaps is not the right procedure to follow. I think they have to really rethink how they do things. Thijs Bouwknegt is a contemporary historian and former journalist with a focus on international criminal justice, transitional justice and African affairs. He is currently a Ph.D researcher at the NIOD Institute for War, Holocaust and Genocide Studies in The Netherlands. He also works as an independent trial monitor at war crimes trials before international and national courts. This interview was conducted by Zipporah Nyamburah.